Careers in Chemistry - Chemistry Encyclopedia - number, What Does a Chemist Do in Industry? An undergraduate program in chemistry prepares the ground for many possible career paths, including industry, graduate work, and professional programs. Choosing a college is beyond the scope of this discussion, but any U.S. school being considered for chemistry studies should offer a degree in chemistry approved by the American Chemical Society, the major professional association of chemists in the United States. Another critical criterion for college selection is the availability of undergraduate research work, a very valuable experience for a chemistry undergraduate; summer research at another college is a possible alternative, as is summer employment related to chemistry. The size of the educational institution is a matter of personal preference. Some students prefer the faculty contact that is available to them at a small liberal arts college, and others desire the wider social and academic choices that they have at a large institution. Most colleges have a basic curriculum that gives students a broad background, but it is still possible for those students to pick courses that support future career plans. For the student leaning toward science, composition and speech courses are always valuable, as are computer courses (including courses in spreadsheet and database fundamentals, computer electronics, and computer networking). Business courses are a useful preparation for management or chemical sales positions. Most chemistry programs require several mathematics courses. Even if not required, courses in statistics, differential equations, and matrix mathematics are, for chemistry students, valuable assets. The same is true for biology and biochemistry courses. What Does a Chemist Do in Industry? Very often, graduates with bachelor of science degrees begin industrial careers as bench chemists, that is, individuals who work directly with chemicals under the supervision of a chemist with a Ph.D. or M.S. degree. Entry-level jobs are usually either quality control jobs (chemical analysis work) or research assistant jobs (one helps to develop new products or to improve existing products). Relatively few chemists remain at these bench jobs for their entire careers (which is why a good undergraduate program includes preparation for other job options—such as sales, customer service, or instrument development). 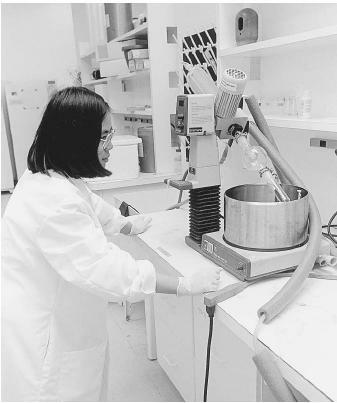 Many chemists begin their careers as bench chemists, in quality control, or as research assistants. Many companies support employees who pursue further education, with partial or full payment of graduate tuition, released time (with or without pay), and even the option of doing joint research at the company (which may fulfill the graduate research requirement). When interviewing, job seekers should check on the availability of graduate programs. They should be warned that going to graduate school while working full time requires tremendous organization and motivation. A doctoral program in chemistry often lasts more than five years. Money is not usually a deciding factor, as matriculation within a chemistry graduate school usually includes an assistant teaching position that pays tuition and living costs. The Ph.D. degree is normally a research degree, and so it requires a commitment to doing research. A master's degree is all that some students will desire. It is also the way to go for students who wish to remedy academic deficiencies before doing advanced work. Research advisers usually expect students pursuing doctorate degrees to spend at least forty to sixty hours a week on research. Graduate courses can be tremendously challenging and can require a heavy time commitment. Most graduate students doing research view college vacation time as the best time to get work done (graduate students do not have the long vacations they knew as undergraduates). Although graduates who obtain doctorate degrees from well-known schools have an advantage when looking for employment, a great many other factors are important in a job search. Some departments or individual faculty members have relationships with particular companies (which also helps when one is looking for a position after graduation). Graduate programs in polymer chemistry, analytical chemistry, or materials sciences provide excellent job opportunities, but are often found at schools that are not highly ranked overall. The main areas of graduate research correspond to the subject matter of typical undergraduate courses: biochemistry, analytical chemistry, inorganic chemistry, organic chemistry, and physical chemistry. One can tentatively identify areas of interest based on one's experience of these courses. One can then look for graduate schools that have advisers working in one's chosen area (or areas). Selecting a research adviser is one of the most important decisions of a career. Looking up graduate departments in the American Chemical Society Directory of Graduate Research , one can easily find out the research fields and publications records of faculty members. Faculty members who have published a small number of articles in refereed journals within the preceding five years may not be still active in research. The applications of chemistry within biology are so important that many chemistry departments have become departments of chemistry and biochemistry, or departments of biological chemistry, and some offer both chemistry and biochemistry majors. Biochemistry is one of the major growth areas in chemistry. Although mergers in the pharmaceutical industry have eliminated some research laboratories, this contraction has been offset by an expansion of startup biotechnology companies. A strong undergraduate program in chemistry or biochemistry is an excellent preparation for professional programs in medicine, optometry, chiropractic, and osteopathy. The combination of chemistry and law school is a powerful one, but one that is not often thought of. Other areas to be considered by chemistry undergraduates are food chemistry, textile and fabric chemistry, forensic science, industrial hygiene, and toxicology . Although the number of jobs available in these fields may be limited, there are few students who have acquired credentials in them, and so the employment opportunities can be excellent. The World Wide Web may be used to obtain more information about these fields and to locate a school with the desired program. Some graduates will not want to limit their job searches to the chemical industry. The analytical thinking and organizational skills typical of successful chemistry majors make them strong candidates for positions as patent examiners or stock analysts. The combination of chemistry with computer science is attractive to many employers. Chemistry majors interested in art or writing may want to consider careers in science journalism or science illustration (although finding training and employment in these areas can be difficult). 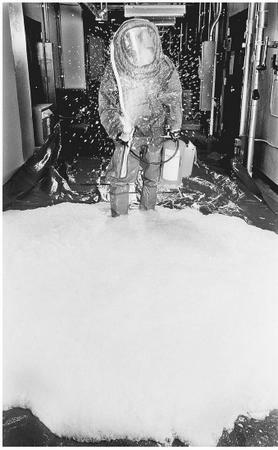 A researcher is spraying decontamination foam in a laboratory to test the neutralization of chemical weapons. Those who wish to teach chemistry will find opportunities at all levels, from middle school to universities. In general, the higher the level of the educational institution, the more education required. High school teachers usually start out with a secondary education degree, and then earn a master's degree while teaching. Teaching at a four-year college typically requires a Ph.D. degree. Because research is not emphasized at two-year colleges, an M.S. degree is often the appropriate certification for teaching at this level. Postdoctoral work is typically a requirement for teaching at a doctoral institution, and at some four-year colleges. SEE ALSO Chemical Engineering ; Forensic Chemistry ; Industrial Chemistry, Inorganic ; Industrial Chemistry, Organic . Woodburn, John H. (2002). Opportunities in Chemistry Careers. Chicago: VGM Career Books.